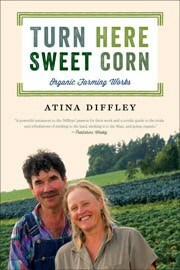 Minneapolis, MN — Turn Here Sweet Corn: Organic Farming Works by Atina Diffley is not your typical family farm “lost way of life” memoir. Instead it tells the dramatic success story of a sophisticated organic family farm from the voice of a female farmer, whose connection to the land is born deeply of knowing it, working it, living and suffering by it. In telling her story of working the land, coaxing good food from the fertile soil, Atina Diffley reminds us of an ultimate truth: we live in relationships—with the earth, plants and animals, families and communities. Atina Diffley is an organic vegetable farmer who now educates consumers, farmers, and policymakers about organic farming through the consulting business Organic Farming Works LLC, owned by her and her husband, Martin. From 1973 through 2007, the Diffleys owned and operated Gardens of Eagan, one of the first certified organic produce farms in the Midwest. To contact Atina or Martin Diffley, visit http://www.organicfarmingworks.com. Please consider a review or feature of Turn Here Sweet Corn, or an interview with the author. Please contact Heather Skinner, Publicist, at presspr@umn.edu with questions, requests, or comments.